Unlike other so-called flying fish which are merely good at jumping, hatchet fish actually flap their specially shaped pectoral fins to help them move further through the air. In the wild, this helps them to catch flying insects, and some aquarists breed fruit flies so they can feed them this way. Of course, you'll need a secure aquarium hood and a good bit of space above the water surface to keep them safe, but they're amazing to watch. To reduce stress further, it's a good idea to provide your aquarium with a dark substrate and background, to give the illusion of security, and to keep some floating plants to provide hiding places near the surface. They enjoy gentle currents that keep plants moving around. If well looked after, they will grow as long as three and half inches. Although watching them catch flying insects is fun, you may prefer not to keep these at home, as there's always a risk of them escaping and infesting your house. 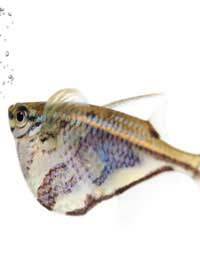 Never feed your fish wild insects as these may be contaminated with dangerous chemicals. The good news is that hatchet fish will do just as well on insect larvae, including freeze dried ones. Because they're surface feeders, hatchet fish are often perplexed by foods like pellets and algae discs, and they'll be unable to compete with other fish for them. However almost any floating food will do, including flakes. A bit of vegetable matter can aid their digestion but they are primarily carnivores. They enjoy eating small crustaceans and are particularly fond of mosquito larvae. There is no difference between the colouration of male and female hatchet fish, but females, especially when gravid with eggs, are noticeably more rounded. If you can't tell from the side, look at them from above to see this. Within a shoal, couples will pair off naturally, but they should be isolated when they're ready to breed or the eggs will be eaten quickly. To stimulate breeding, provide a quiet, sheltered tank with soft, acidic water and plenty of floating vegetation - this is where the eggs will be laid. Remove the parents afterwards. The fry should be fed with liquid food for the first few days, but will soon be able to move on to a diet of rotifers and crumbled flakes.